Thursday, October 1st @ 11:00 AM EDT (GMT -4) An essential webinar for scientists interested in methodology, best-practices and techniques for identifying early and subtle quantitative physiological markers of strength, balance and coordination in animal models of pain, CNS, neuromuscular and neurodegenerative disorders. 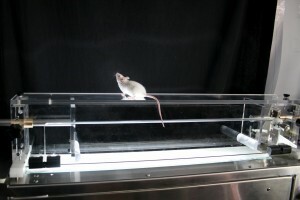 Gait analysis in lab animals is increasingly being recognized as a key feature in the research of disorders that affect human motor behavior. For example, gait disturbances are symptomatic of patients with Parkinson’s disease, muscular dystrophy and arthritis, but rarely has gait been studied in the animal surrogates. Other assays, such as grip strength, rotarod and activity fall short, both individually and collectively, in describing the convergence of strength, balance and coordination in enabling a subject to ambulate. In this webinar we therefore aim to present key concepts regarding how gait can be studied and its value as a research method for animal models of pain, CNS, neuromuscular and neurodegenerative disorders. In this exclusive event sponsored by Mouse Specifics, Inc., Dr. Thomas Hampton will provide an overview of essential parameters for studying gait in laboratory rodents. Topics will include key aspects of coordinated movement [walking] such as stride, swing, stance and ataxia. He will discuss how animals execute “stepping” via the convergence of motor and sensory inputs and will present a myriad of conditions that can affect walking along with how these conditions can be quantified for use as physiological markers of movement disorders. Dr. Charles Meshul, Research Biologist and Professor at Veterans Hospital, Portland and Oregon Health & Sciences University, will present gait data obtained from his lab using a progressive animal model of Parkinson’s disease. His group has shown that weekly treatment with the neurotoxin, MPTP, for up to 4 weeks, results in a gradual loss of dopamine within the nigrostriatal pathway. He will discuss how this unique model may or may not correlate to the extent of motor function tests available and will discuss the sensitivity of gait analysis in describing mice with Parkinson’s disease. Dr. Meshul will also describe other studies in which deficits in nigrostriatal dopamine can be blocked or even reversed and whether certain measures of gait function can show corresponding improvement. Dr. Carol Milligan, Professor of Neurobiology & Anatomy at Wake Forest School of Medicine, will present on behavioral deficits that correlate with early pathology in the SOD1 mouse model of amyotrophic lateral sclerosis (ALS). As Dr. Milligan describes, one potential explanation for why preclinical studies in animal models have not translated positively to clinical trials may be insufficient understanding of when and where pathogenesis begins. Characterization of these early events and correlation to human disease is essential, however, for insight into disease onset, discovery of presymptomatic diagnostic disease markers, and identification of novel therapeutic targets. Dr. Milligan will highlight early pathological changes identified in her lab and, importantly, analysis of mouse movement that has revealed deficits corresponding to early pathology. She will also highlight that careful characterization of disease models is critical to the design of scientifically sound preclinical studies. President and CSO, Mouse Specifics Inc.